Introduction: The saddle nose may be caused by many factors: biologic, genetic and iatrogenic. The lesions may affect the cartilaginous and osseous parts or both. Surgical intervention is required to correct the anatomic and physiologic disorders and improve the aesthetic and emotional aspect. Objective: The objective of this case report is to approach different surgical techniques for rebuilding of the saddle nose, by emphasizing the use of the chondrocostal cartilage. Case Report: The patient DBJD, 43 years old, presented nasal deformity, saddle nose, of traumatic etiology. He was submitted to correction using chondrocostal cartilage. Final Comments: The use of this cartilage for rebuilding of the saddle nose has an easy handling and a good aesthetic-functional outcome. The nose as an anatomic structure of facial projection is vulnerable to traumas and its presentation offers a personalized level of differentiation. The anatomic normality pattern of the nose is relative and depends on the human biotype, although there are patterns that are typically considered to be abnormal. The nose is formed by two parts: a mobile (cartilaginous) part and a fixed (osseous) part. Physiologically the function of this organ is to warm, purify and humidify the air inhaled (1). When there is an anatomic deformity such as commitment of the dorsum, saddle nose, scoliosis, septal deviation or a congenital anomaly, it may damage its physiology and even cause systemic disorders (2). The saddle nose may result from a traumatism followed by septal abscess. We consider as etiological factors of the saddle nose the infections such as hanseniasis, syphilis, tubercles and blastomycoses. We also stand out the iatrogenic causes, original basically from the orbito-naso-frontal surgeries sequels (2). According to Villela, the craniofacial traumas result in depressions of the dorsum of the nose, called saddle nose, which cause lesion in the orbit inner corner and lead to the nasal coloboma. The lachrymal system may be affected, which leads to dacryocystitis. The patient may suffer nose obstruction and must sometimes submit to surgical correction of the septum and the infundibulum (3). The nose is a structure vulnerable to trauma and if it is not corrected suitably, the trauma will result in anatomo-physiological sequel. This is called saddle nose, which is classified into anterior, due to affection of the cartilaginous portion, and posterior, as an affection of the osseous portion. Today, despite the large records in the literature about the different kinds of grafts, in this case report we aimed to the costal graft for the surgeon's technical facility. We must be careful of the osteogenesis that, differently from what was thought, is caused by the receiving tissues and not by the donators (1,4). 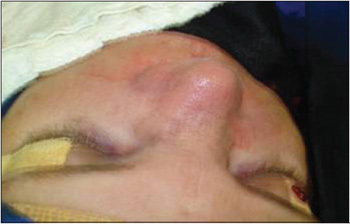 According to LIMA, the saddle nose may be anterior due to the constriction of the dorsum, and appears as a consequence of the nasal septum infection and its contusions; the posterior occurs because of the craniofacial traumatisms such as traffic accident contusion and granulomatous infections (5). THOMASSIN et al. apud GURLEK et al. briefly describe the causes of the saddle nose, as divided into three large areas: traumatic and iatrogenic infections. The use of biomaterials, bone, cartilages and synthetic material have already been described as a solution for the support of grafts (6). The objective of this case report is to approach different surgical techniques for rebuilding of the saddle nose, by emphasizing the use of the chondrocostal cartilage. The first nose reconstruction surgeries started in India in the seventh century before Christ. The type of material that must be used for the correction of the saddle nose must aim at the features of being easily obtained, molded, low cost, causing a minimum of tissue reaction and reabsorption by the body. The alloplastic implants have been used in nose surgeries and the advantage is the simplification of the surgery, although it has a significant rejection rate. The homografts offer an advantage over the self-grafts, because they are less subject to shortening. Among the self-grafts used, we remark the septal and costal cartilages. The use of a given type of graft and a surgical technique is bound to the surgeon's experience (7). Over time, as far as the osseous reconstruction in the face is concerned, the first surgical procedure carried out was aimed at repairing a cranial defect and the canine xenograft was used. For the saddle nose surgical correction the tibial crest, spine, ulna and cranial cap were used. As for the use of the spine autogenic graft, the cartilaginous, osseous and osteocartilaginous segments may be managed. There are reports of their application as from 1920 by the surgeon GILLIES (1). According to RAMOS et al, the saddle nose correction may be made by different techniques and/or surgical tactics, but the use of a piece of the auricular pavilion offers good results. The advantage of such use is aimed to the easiness of removal of the donating area and to the aesthetic outcome, but, the disadvantage we stand out is the need for a new surgery due to the inconvenient absorption of the graft and the technical difficulties inherent to the own nasal pyramid (2). For GURLEK et al., the use of the lower infundibulum is favorable for the saddle nose reconstruction because it offers easy obtainment, low cost, readiness to be used, without long term reabsorption and there is no need for a secondary donating area increasing the air passage, thus preventing a possible obstruction. The authors present three cases of saddle nose and apply such material for their reconstruction. In the surgery, the lower infundibulum was sectioned with scissors and dissected so as to leave the periosteum intact. The size and volume of the graft met the conditions of the format of the mold previously produced. The lower infundibulum bone has a slight absorption because it has a membranous rather than an endochondral type (6). DEMIRTAS et al. report the use of biosynthetic screw for fixing the parietal bone and for nasal reconstruction, especially in the case of the saddle nose. Ten patients took part, and they succeeded and showed a therapeutic option for the correction of this deformity. The advantage from the use of the parietal bone is due to the fact it does not have osseous reabsorption and by using a screw there is no need for a second surgery for its removal. A bone graft was removed, which was adjusted to the saddle nose deformity. An incision of the nasal dorsum was made towards the craniocaudal region and the graft was inserted with a subsequent cranial fixing with biodegradable screw. The screw was fixed a centimeter below the nasofrontal angle. The advantage of its use consists of the best method for graft fixing, because it offers an absolute bone immobilization and does not cause reabsorption around the thread (8). In nasal deformities preceded by saddle nose, the use of the Kirschner thread fixed in the frontal process of the maxilla is an easy and safe way without any skin deformity. The use of such techniques proves favorable in nasal fractures, followed by the septal fracture and instable fixing, which could cause a secondary deformity. In case the frontal process is instable due to the fracture, it must first be fixed or the Kirschener thread must be sutured in some other stable bone. The nose complex deformities of the saddle nose may be followed by other abnormalities such as nasal hypoplasia, epicanthal folds, low projection of the nasal tip and short columela. In these cases, the sixth costal cartilage is used, by using the standards by GIBSON and DAVIS. When they are used, the features of the costal graft offer the advantage of consistency, flexibility, facility to shape, low immunity and low reabsorption and resemble the costal cartilages, and such graft may be the choice over the use of the traditional grafts of iliac crest or calvary bone and proves to be a good option. The reconstruction of the saddle nose needs sufficient material to sustain the retractions that may occur in the postoperative, and the costal cartilage is the best graft for such task (9). As from the 70's GILLIES approaches a technique by using a piece of skin from the nasomaxillary region for the surgical treatment of the saddle nose. An upper vestibular incision is made towards the maxillary periosteum; the dissection in the anterior septal part goes on and releases all the nasal dorsum. A thigh skin fragment is placed in the skeleton. Two weeks later the mold is removed and silicon is temporarily placed to preserve the space. Approximately three months later, a permanent prosthesis will be placed ultimately. Such method was originally used by GILLIES only in severe cases of saddle nose or in the case of syphilis. This technique was largely used by other authors. Today this technique was abandoned due to the large number of complications and the appearing of finer and less traumatic techniques (10). For corrections of small alterations of the nasal dorsum, KALOGJERA et al. used the upper and lower cartilages. In the lower alar cartilage a vertical incision is made with the upper pedicle. The same procedure is made in the opposite cartilage. Two pieces are raised for the performance of suture. This cartilaginous fragment will be placed on the upper segment of the nasal septum. In the upper cartilage an incision is made in the area of union with the quadrangular cartilage. Then the upper cartilage is raised and medialized and suture is made from the segments previously sectioned. 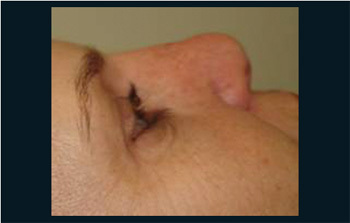 This technique promotes a significant improvement of the facial aesthetics, increases the nose tip projection and corrects the columela retraction, as well as reestablishes the nasal foramen and improves the nasal breathing (11). ÇELIK et al. describe the use of septal and auricular cartilage for the severe reconstruction and prefer to use the cranial osseous grafting. The authors used the osteocartilaginous piece in small deformities of the nasal dorsum in more than 60 patients. In significant deformities they used the temporoparietal osseous grafting associated to the auricular cartilaginous portion, and these were interposed and united with Spongostan®. Curative is kept under pressure for two weeks and the grafting will be in place within three months. In cases of subtle deformities of the saddle nose, a very fine grafting layer may also be necessary, and then, as described by the literature, the use of autogenic grafting is preferred (12). The patient DBJD, 42 years old, born in Itajubá, Minas Gerais, sought the Otorhinolaryngologic service for evaluation of the possibility of correction of saddle nose. The physical exam confirmed the nasal deformity with the aspect of saddle nose with commitment of the very bones of the nose. The patient reported having suffered a fall that resulted in the nasal deformity and only nasal obstruction was presented as a clinical record. The otorhinolaryngological physical exam presented nasal obstruction with septal deviation and lower infundibulum hypertrophies. There was a clear commitment of the bones of the nose in their lateral portions. Upon general physical exam nothing was significant. All the devices found normality patterns. The patient was submitted to the following specific exams: Videorhinoscopy and X-rays of the paranasal cavities. Out of these, the relevant result was found by videorhinoscopy, which confirmed the partial nasal obstruction due to septal deviation and lower infundibula hypertrophies. After evaluation and cardiorespiratory release, as for the surgical risks, septoplasty, turbinectomy and saddle nose correction were indicated. For the correction of the latter, we opted for the use of costal cartilage and the surgical procedure was indicated. We initially opted for the correction of the infundibula, proceeding with partial lower turbinectomy to make the surgical access to the nasal septum easier, if required. Septoplasty was then carried out by the Killiam's technique. For the saddle nose correction, we opted for the use of the eighth costal cartilage. A molding of the saddle nose area that presented the deformity was made with plastic model so as to offer local length, width and thickness. The costal cartilage was molded so as to approach as close as possible to the model to be placed in the area of loss. We proceeded with an incision of one centimeter in the intercartilaginous spaces bilaterally to be able to couple the cartilage. After performance of this procedure, the bone graft was placed and fixed with a transfixing point, three 3-0 nylon thread, one cranial and another caudal. Finally the sutures in the costal areas were carried out with three 3-0 nylon thread and nasal with 2-0 catgut, followed by splint and placement of the breathing tube. The nasal dorsum was maintained with micropore. Figure 1. Preoperative presentation of the saddle nose. Figure 2. Exposure of the grafting showing its accommodation. Figure 3. Presentation in the postoperative. For surgical correction of the saddle nose, out of the several techniques and the different grafts, we remark the use of costal cartilage chosen since the beginning of the surgical procedures for correction of this physical deformity (1). The correction of the nasal deformity is extremely important to reestablish the anatomy and the respiratory physiology, which we ratify in the postoperative (2). We also remark that we did not find other complications associated with this deformity in the peroperative (3). We ascribe the septal deformity to nasal traumatism, which is also reported by other authors (4, 6). The experience of the professional is important for the choice of the best graft and the surgical technique to be elected for the success of the surgery (7). We preferably use the chondrocostal cartilage for reconstruction of the saddle nose. There is a good acceptance for the own characteristics of this tissue allied to a good aesthetic-functional outcome. Although utilized by many authors, the exogenous grafting for correction of the saddle nose has not yet been much studied and is expensive for the reality of the Brazilian medicine (8). Several reconstruction techniques of the saddle nose are approached in the literature (1, 2, 6, 7, 8, 11 e 12), but we chose the reconstruction using the chondrocostal cartilage that offered us a good outcome that meets and is aligned with the literature results (1, 4, 7, 9). The homologous cartilages are more deeply studied and when applied they offer good aesthetic results. We chose the costal cartilage because it has low osseous reabsorption, easy handling, low morbidity of the donating area and is easily adapted even in large nasal traumas. We must be attentive because the osteogenesis comes from the receiving area and not from the donating area, differently from what we thought (1). Despite the several techniques described by different surgeons, the patient's satisfaction with the technique was evident, as well as the success of the anatomic correction of the saddle nose and improvement of the respiratory physiology. The use of chondrocostal cartilage for reconstruction of the saddle nose is a surgical alternative of easy management, good aesthetic-functional outcome and good acceptance by the patient. 1. Costa EA, Pitanguy I. Enxerto costal em nariz. Rev Bras Cirurgia. 1991, 81(4):197-3. 2. Ramos CC, Mello JR JF. Cornetos nasais na reconstrução do dorso nasal. Relato de caso cirúrgico. Arq Intl Otorrinolaringol. 1992, 8(5):195-205. 3. Villela FS, Reginato LE. Tratamento das fraturas naso-orbitárias nas crianças e suas seqüelas-atualização e considerações em torno de dois casos. Rev Bras Otorinolaringol. 1972, 38(2):267-2. 4. Demirtas Y, Yavuzer R, Findikcioglu K, Atabay K, Jackson IT. Surgical Strategies - Fixation of the Split Calvarial Graft in Nasal Reconstruction. The Journal of Craniofacial Surgery. 2006, 17(1):131-8. 5. Lima, JC. Nariz em Sela-Etiologia, Clínica e Técnica Cirúrgica. In: Sociedade Brasileira de Cirurgia Plástica. Anais do Simpósio Brasileiro do Contorno Facial. s.l. Sociedade Brasileira de Cirurgia Plástica. 1983, 188-93. 6. Gurlek A, Askar I, Bilen BT, Aydogan H, Fariz A, Alaybeyoglu N. The use of Lower Turbinate Bone Graft in the Treatment of Saddle Nose Deformities. Aesthetic Plastic Surgery. 2002, 26:407-12. 7. Patrocínio L, Patrocínio A. Uso de Enxertos em Rinoplastia. Arq Intl Otorrinolaringol. 2001, 5(1):21-5. 8. Yabe T, Muraoka. Treatment of Saddle Type Nasal Fracture Using Kirschner Wire Fixation of Nasal Septum. Annals of Plastic Surgery. 2004, 53(1):89-92. 9. Riechelmann H, Rettinger G. Three-Step Reconstruction of Complex Saddle Nose Deformities. Archives of Otolaryn-gology - Head and Neck Surgery. 2004, 130:334-38. 10. Okazaki M, Ohmori K, Akizuki T. Long-Term Follow-Up of Nasomaxillary Epithelial Inlay Skin Graft for the Saddle Nose. Plastic and Reconstructive Surgery. 2003, 112(1):64-70. 11. Kalogjera L, Bedekovic V, Baudoin T, Ivkic M. Modified Alar Swing Procedure in Saddle Nose Correction. Aesthetic Plastic Surgery. 2003, 27:209-12. 12. Çelik M, Haliloglu T, Bayçin N. Bone Chips and Diced Cartilage: An Anatomically Adopted Graft for the Nasal Dorsum. Aesthetic Plastic Surgery. 2004, 28:8-12. 1. Doctoral Degree in Otorhinolaryngology at the University of São Paulo - USP/SP. Staff at the Hospital Odontomed. 2. Medical Student at the Medical School of Itajubá - MG.
3. Doctoral Degree in Otorhinolaryngology at the University of São Paulo - USP/SP. Head Professor at the Pontifical Catholic University of São Paulo. 4. Post-graduation in Anesthesiology at USP/SP. Staff at the Hospital Odontomed. 3629-5333 - E-mail: fsalesdr@sulminas.com.br. Article received on September 9 2008. Approved on February 24 2009.